. . .Tobo, and under the government of Banda, the surf was very heavy, owing to a strong westward swell. We therefore rounded the rocky point on which the village was situated, but found it very little better on the other side. We were obliged, however, to go on shore here; and waiting till the people on the beach had made preparations, by placing a row of logs from the water's edge on which to pull up our boats, we rowed as quickly as we could straight on to them, after watching till the heaviest surfs had passed. The moment we touched ground our men all jumped out, and, assisted by those on shore, attempted to haul up the boat high and dry, but not having sufficient hands, the surf repeatedly broke into the stern. The steepness of the beach, however, prevented any damage being done, and the other boat having both crews to haul at it, was got up without difficulty. Better than The origin of species. poor Wallace, scientific world should pay more attention to his tribute on theory of evolution. 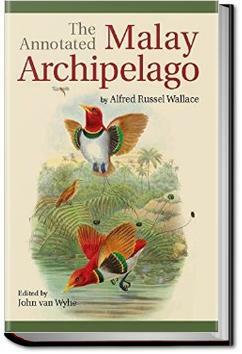 For 8 years, from 1854 to 1862, Alfred Russel Wallace journeyed to the southern portion of the Malay Archipelago including Malaysia, Singapore, the islands of Indonesia (then known as the Dutch East Indies) and the island of New Guinea, travelling over 14.000 miles. a nice insight on natural and sociological condition of Indonesia (and the sorrounding area) in the late 1800s. Buku yang berat (*dalam arti sebenarnya) ini merupakan catatan perjalanan Alfred Russell Wallace di Nusantara dalam rangka meneliti keanekaragaman hayati di belahan bumi tersebut.